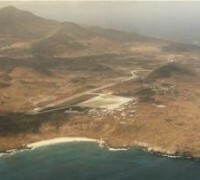 Probably no other air base used by the Air Transport Command had such strategic importance as that on Ascension Island. 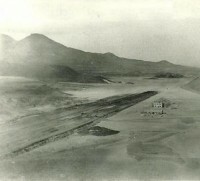 This anchored airdrome of volcanic rock, covering an area of only thirty-four square miles, was located in the South Atlantic approximately midway between the Brazilian bulge and the African coast. Ferrying Command officials had turned their attention to Ascension as a potential base as early as the fall of 1941, when it became clear that American military as well as lend-lease planes would be flying the South Atlantic route to Africa. Situated 1,437 statute miles from Natal, and 1,357 from Accra in the Gold Coast Colony, Ascension would make it possible for two-engine planes to cross the South Atlantic in two fairly easy jumps with a normal gas load. Before the base was opened, twin-engine craft could make the approximately 1,900-mile direct flight from Natal to Africa across the narrowest part of the Atlantic only after the installation of extra gas tanks, an expensive and time-consuming modification. Four-engine bombers and transports could fly directly from Natal to Roberts or Hastings Fields in Africa without difficulty, or even to Accra, 2,500 miles away, but, by using refueling facilities on Ascension, four-engine transports could take on a much lighter load of gasoline at Natal, increasing proportionately the amount of payload carried. With a stop at Ascension, it was even possible to ferry fighter aircraft to Africa, as was done with P-38's in 1943, an accomplishment that otherwise would have been impossible. In peacetime, Ascension was a British cable station and had a normal population of about 165 cable-company employees, the maximum number that could be sustained on the island by its limited water supply. Negotiations were opened with the British early in 1942 for use of the island for an airdrome. Britain readily agreed; if for no other reason, she stood to benefit tremendously in the greater ease with which lend-lease deliveries to Africa could be affected. A board of American officers, headed by Lt. Col. Philip G. Kemp of the Ferrying Command, made a preliminary survey of Ascension and selected a tentative site for the airdrome. By March 1942 an American task force, made up principally of troops of the 38th Engineer Combat Regiment, but containing also coast artillery, quartermaster, signal corps, hospital, army airways communications, and other units, was on its way to the island to begin construction work. Unloading the supplies, machinery, and construction materials from the three freighters was no easy job. Ascension has no harbor proper, and the projecting shelf of volcanic rock prevents ocean-going vessels from making a close approach to shore. Supplies had to be unloaded by barge or lighter, but even this was impossible when heavy southwest rollers were running. Construction work got under way by 13 April, and less than three months later, on 10 July, the 6,000-foot runway was open for traffic. In the meantime, the task force had constructed underground gasoline storage tanks, roads, barracks, a hospital, a distillation unit for distilling sea water, an electrical plant, gun emplacements, and ammunition dumps, all carefully camouflaged. There was an airman's ditty, originating with some imaginative pilot on the South Atlantic run, that goes: If I don't hit Ascension My wife will get a pension....Actually, the island had a radio beam on it, and the navigators had no great trouble hitting it. The real worry of the ferry or transport pilot, in the early days at least, was taking off from the Ascension runway in the face of a great cloud of birds. It had long been the habit of the sooty tern, known locally as the "wide awake," to come to Ascension to lay and hatch its eggs. 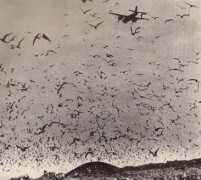 Within a few weeks after the Ascension airfield had been opened for traffic, the terns began to arrive on schedule. One large colony's usual nesting ground was located just beyond the far end of the newly constructed runway. This did not discourage the birds, however, and they settled down to lay their eggs and stay for the nesting period. They were a real menace to plane and pilot, for every time a plane started down the runway the roar of the motors brought a huge flock of birds into the air right in its path. Heavier planes, unable to climb quickly enough, were obliged to pass right through the mass of birds, running the risk of a broken windshield, a dented leading edge, or a bird wedged in engine or air scoop. Getting rid of the wide awakes was a headache that brought sleepless nights to the highest echelons of the AAF. Smoke candles were tried, and dynamite blasts, but both proved equally not effective. Someone got the inspired idea that cats would do the job, but when a planeload of cats was brought in to kill off the terns, the cats were themselves eaten by booby birds, a larger species with an extremely strong beak and neck. Finally, AAF Headquarters sent down a well-known ornithologist, Dr. James P. Chapin of the American Museum of Natural History, who advised that, if the eggs were destroyed, the birds would leave and not again nest in the same area. With some 40,000 of their eggs smashed, the terns began finally to move away from the runway area to join colonies on other parts of the island. AAF officials from Washington to Chungking rested easier. C-47's, B- 25, P-39 Airacobras, B-26 Marauders, Mitchell B-25 twin engined bombers, all them had a limited range and could only sweep an area immediately around Ascension. None of them could match the heavy PBY-4 long range Liberators which could perform long patrol sweeps over the vast expanses of south Atlantic in search for the perilous U-boats , Blockade Runners and Raiders. Several U-boats, and blockade runners were attacked and sunk by these thundering four engined bombers. Despite their superb firepower of .50 caliber machine guns, depth charges, clusters and demolition bombs, a few of them were downed by fierce antiaircraft fire from the U-boats when caught by surprise while sailing surfaced. Several other B-24 were also hit by A/A and with oil or gas leaks, mains ruptured or crewmembers injured. They relied on the overpower of their remaining engines for hundreds of miles and count on their courage and skill to find that tiny rock in the vastness of Atlantic and finaly to land safely.